Ludwig van Beethoven, one of the most influential composers of all time, is brought vividly to life and made relevant to today’s young musicians in Beethoven for Kids. Children will learn about Beethoven’s troubled childhood and family life, early gift and passion for music, volatile personality, championing of equality and freedom, and persistence in his work despite increasing hearing loss. The great musicians, thinkers, and movements of Beethoven’s time, from Mozart and Haydn to the bold new ideas of the Enlightenment, are presented and their profound effect on the composer's life and music explained. Twenty-one engaging activities, including singing musical variations, dancing a Viennese waltz, creating an operatic diorama, and making a model eardrum, illuminate Beethoven’s life, times, and work. A time line, a glossary, online resources, and recordings and reading lists for further listening and study round out this comprehensive resource. The rich story of the men and women who settled and built the Golden State is told in this engaging chronicle, from the first native inhabitants that arrived 9,000 years ago and the Spanish in the 1700s to the followers of the Gold Rush in 1848 and the Hollywood and Silicon Valley newcomers. They faced many struggles—including earthquakes, economic hardships, and the forced internment of Japanese citizens—yet they persevered. To get a better idea of the scope of California history and the lives of the state’s residents, children will create a Chumash rock painting, play the Miwok game of Hoop and Pole, bake and eat hardtack like a gold miner, design a cattle brand, assemble an earthquake preparedness kit, and more. This valuable resource also includes a time line of significant events, a list of historic sites to visit or explore online, and Web resources for further study. From John Muir pushing a president and a nation into setting aside vast preserves—including Yosemite, Sequoia, Mt. Rainer, and the Grand Canyon—to Julia “Butterfly” Hill saving a 1,000-year-old redwood while bringing to light the devastation of our old-growth forests, Friends of the Earth chronicles the efforts of the men and women who dedicated their lives to protecting the United States’ natural heritage. Other notable profiles include John James Audubon, who introduced the study of birds to North America; Marjory Stoneman Douglas, who worked to conserve the Florida Everglades; and Rachel Carson, who opened the world’s eyes to the dangers of pesticides. Together, these environmentalists’ inspiring life stories tell the history of American environmentalism, from its inception to the present day. In this comprehensive resource, children also learn how to put their concerns into action. Step-by-step instructions on how to build a birdfeeder, conduct a water quality survey, start a compost pile, create their own recycled paper, and test for acid rain are included, as well as a time line of historic milestones and a list of popular parks and sites to visit or explore online. An intriguing, in-depth look at the most famous home in the United States, this kid-friendly activity book educates young readers on the White House. Blending facts from numerous primary sources with engaging anecdotes—from learning that George Washington never actually slept in the White House and Abraham Lincoln never slept in the Lincoln Bedroom to how Gerald Ford's daughter Susan held her high school prom in the White House—this book provides the complete story of the presidents' home. Details on the many changes, updates, renovations, and redecorations that have occurred over the years are featured as well as a look at the daily lives of the White House's inhabitants, including past presidents and their families along with the enormous staff that makes the White House run smoothly. This rich history is packed with an assortment of cross-curricular activities that allow readers to walk in the footsteps of presidents—they can play key passages of "Hail to the Chief," practice signing a bill into law, make a White House punch, and re-create an aerobic game designed for President Hoover—making it a perfect book for any young mind with an interest in the White House or American history. Drawing heavily from the original letters and papers of Thomas Jefferson and his contemporaries, this resource chronicles the world of the Founding Father who wrote the Declaration of Independence. From his early critiques of the colonial policies of Great Britain and King George III to his governmental roles as the first secretary of state, the minister to France, and the third president of the United States, Jefferson’s groundbreaking achievements are described in historical context. The contradictions in Jefferson’s character—most notably the fact that he owned 600 slaves in his lifetime despite penning the immortal phrase "all men are created equal"—are also explored, giving kids a full picture of this skilled politician. Creative activities that invite children to experience Jefferson's colonial America include designing a Palladian window, building a simple microscope, painting a “buffalo robe,” and dancing a reel. Giuseppe Verdi, one of the most influential composers of the 19th century and a dominant force in Italian opera for 50 years, is illuminated in this thorough exploration geared toward young musicians. Offering insight into Verdi’s long life—from the horrible loss of his family to the disapproving opinions of his neighbors—and opening the world of opera and Italian culture, this resource creates an accessible and tangible investigation into the elite world of classical opera. Engaging and creative activities, such as singing like a diva, making a panpipe, playing bocce ball, and sketching a costume for Falstaff, reinforce the musical concepts and terms that are introduced within and elucidate the times in which Verdi lived. Along with learning about various opera jobs, opera production, what takes place at rehearsals, and opera house history, inquisitive kids will gain a fuller understanding of Verdi’s life, times, and music and how the composer intersected with the great musicians and events of his lifetime. An educational and interactive children's guide to the Great War In time for the 2014 centennial of the start of the Great War, this activity book provides an intriguing and comprehensive look at World War I, which involved all of the world's superpowers during a time of great technological and societal change. Emphasizing connections among events as well as the war's influence on later historical developments, it leads young readers to fully understand the most important aspects of the war, including how the war came about, how changing military technology caused the western front to bog down into a long stalemate, how the war fostered an era of rapid technological advances, and how the entry of the United States helped end the war. 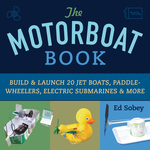 The book explores topics of particular interest to kids, such as turn-of-the-20th-century weaponry, air and naval warfare, and the important roles animals played in the war. Relevant crosscurricular activities expand on concepts introduced and illuminate the era of the early 1900s, including making a periscope, teaching a dog to carry messages, making a parachute, learning a popular World War I song, and more. From cobras and copperheads to pythons and boas, all types of snakes are covered in this book of 40 science experiments, art projects, and games that helps budding herpetologists gain a greater appreciation for these slithering reptiles. Activities include making foldable fangs to learn how snakes' teeth and jaws work together; simulating cytotoxic snake venom while making a tasty snack using an everyday enzyme found in pineapple; and mimicking the sound a rattlesnake makes by using a rubber band, a paper clip, and an envelope. Engaging, simple, and safe experiments teach kids about the biology of snakes, such as how they use their tongues and nostrils to detect smells, how they are cold-blooded and sensitive to subtle changes in temperature, and how they can detect the slightest vibrations or tremors. Kids do not need a snake for any of the activities and will delight in all the strange snake facts and gross-out projects such as Snake Stink—where they create their own signature stink and test how well it repels potential predators. 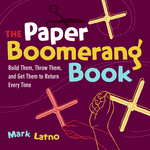 Introducing sophisticated mathematical ideas like fractals and infinity, these hands-on activity books present concepts to children using interactive and comprehensible methods. With intriguing projects that cover a wide range of math content and skills, these are ideal resources for elementary school mathematics enrichment programs, regular classroom instruction, and home-school programs. Reproducible activity sheets lead students through a process of engaged inquiry with plenty of helpful tips along the way. A list of useful terms specific to each activity encourages teachers and parents to introduce students to the vocabulary of math. This second Big Ideas book covers more advanced concepts, with projects including “One in a Million,” where children use grains of rice to model the probability of astronomical odds; “Triangular Tessellations,” in which students investigate the geometry and variations created by repeating patterns; and “Fractions of Salaries,” where kids use a real-world scenario to multiply and divide fractions. Here’s a fun way to get young minds discovering the wonders of the natural world by making predictions, testing them, and then evaluating the results—learning the scientific method. These short, bite-sized, deliciously fun activities like "Sounds of Chewing," "Clinks in the Kitchen," "Tangy Tongue," and "Shoe Show" take only 15 minutes to organize, do, and clean up. Many of the activities involve food, so children will learn and get a snack at the same time. This activity guide introduces children to the wild and often misunderstood environment of the desert and the people and cultures that thrive in and around them. Information is included on all types of deserts—hot and dry, coastal, semiarid, and polar. Kids learn what defines a desert and the creative ways plants and animals have adapted to survive in harsh desert environments. Also discussed are urban sprawl and its effects on desert habitats and how children can help protect this delicate environment by conserving energy and reducing consumption of petroleum-based products. Engaging activities include drawing a petroglyph, making a coral snake bracelet, frying prickly pears, conducting a gerbil study, and making sand art. Kids will learn valuable hands-on lessons from this guide by constructing working models that generate renewable, alternative energy. Budding scientists learn how to build their own Kelvin water-drop generator out of six recycled cans and alligator-clip jumpers; a solar-powered seesaw from a large dial thermometer and a magnifying glass; and a windmill from eight yardsticks, PVC pipe, cardboard, and a converter generator. Children will investigate the energy-generating properties of a solar cell, a radiometer, a Nitinol heat engine, and a Peltier cell—there are even plans to build a human-powered desk lamp. Each project includes a materials and tools list as well as online information on where to find specialized components. With fascinating experiments, models, and demonstrations, this scientific survey provides a vivid exploration of natural phenomena. Ideal for budding earth scientists, this in-depth resource demonstrates how to build a seismograph to record a simulated earthquake, compare pressure waves and shear waves—the two types of ground shocks—with a Slinky, and replicate a tsunami’s destructive effect on a “coastline” built in a bathtub. The chapters answer questions such as Can animals “predict” earthquakes? How have various cultures explained the movement of the earth throughout history? and Why do some volcanoes ooze rivers of lava while others blow their tops? Additional topics include how to earthquake-proof homes, protect oneself during a tremor, and construct simple models to test seismographs. Blending memorable music with a historical context, this exploration provides a fresh perspective on the civil rights movement by showing how certain songs served as its voice. From the Chicago Children’s Choir to the SNCC Freedom Singers, this resource examines the churches and groups that worked to counteract segregation, transforming traditional spirituals to fit the struggle for civil rights. The galvanizing roles of numerous songs are discussed in detail, such as “Lift Every Voice and Sing,” “Precious Lord, Take My Hand,” “Wade in the Water,” and “We Shall Overcome.” An accompanying CD, Songs on the Road to Freedom, features the Chicago Children’s Choir performing the songs discussed throughout the book. Budding gardeners will learn what it takes to make things grow with fun activities that require only readily available materials. 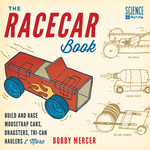 This hands-on science activity book for children 5 to 8 promotes health and safety through 70-plus creative projects, recipes, and experiments. Handwashing becomes automatic and germs become real when children see the once-invisible microbes on their hands thriving in the tomato-soup cultures they’ve prepared. They rush to brush after watching the effects of sugary drinks on a tooth. Nutrition and exercise are fun with treats like Triple-Decker Mouthfuls and games such as Exercise Bingo. Lego people and Silly Putty help to demonstrate the importance of seat belts and bike helmets, and safety becomes a priority as children chant important numbers, identify exits in buildings, and more. All the activities are tested in homes and classrooms to be sure they are safe, effective, and fun. From butterflies and beetles to crickets and katydids, these experiments, art projects, and games will bring out the entomologist in every kid. Activities include collecting and sketching insects, making a terrarium for observation, raising mealworms, using math to measure bug strength, gardening to attract butterflies and other insects, and making an insect amplifier. A unique insect board game helps kids learn fascinating bug facts while they play. Sidebars offer a look into the world of professional entomology, as well as gross facts about insects that will provide great playground trivia, including the USDA's guidelines for allowable insect parts per cup of food. Kids will learn that science is not just something to read about, but something they can observe and study in the world around them. Enthusiastic young gardeners have the opportunity to develop a green thumb and experience the joys of gardening in this how-to guide for kids. Eighteen time-tested, proven projects gleaned from the author's experience as director of the Good Earth Kids' Club teach children how to create a year-round assortment of container gardens that are simple to create, fun to work on, and in many instances, make great gifts. Organized by season, the chapters run the gamut from "Great Big Garden Bowls for Mom" and "Father's Day Fountains" to sand art terrariums and special occasion holiday containers. 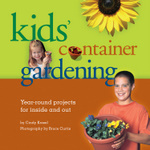 In addition to providing the basics on plants and gardening, this helpful guide also includes a glossary of terms, a listing of plants and resources used in the book, and numerous photographs to show kids that they're proceeding on the right path as they create their individual containers. From addition and subtraction to plane and space geometry, simultaneous linear equations, and probability, this book explains middle school math with problems that kids want to solve: “Seventy-five employees of a company buy a lotto ticket together and win $22.5 million. How much does each employee get?” Intriguing facts about the history of math show what a human creation it is, and human errors are revealed through explorations of both Maya and Hindu concepts of zero as well as Mr. William Shanks’ 1858 attempt at hand-calculating pi. 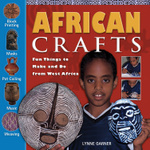 Parents, teachers, and caregivers looking for ideas on how to get children outdoors and instill in them a love of nature can find more than 75 creative crafts, games, and activities using objects that kids can collect from nature in this idea book. As children make race cars out of rocks, create paint from plants, and assemble funny grass masks, they learn to be environmentally friendly—absorbing information on recycling, reducing waste, and inspiring others to protect nature. Organized by the various natural materials needed, the crafts offer a new twist on perennial homemade gifts and school projects. North America boasts a surprising number of rainforests, including El Yunque National Forest in Puerto Rico, Olympic National Forest in Washington State, Chugach and Tongass National Forests in Alaska, and the forests in Hawaii, which are home to an enormous variety of plants and animals. Rainforests: An Activity Guide takes kids through the common layers of the rainforest, from the forest floor to above the enclosed canopy. Their journey continues through the different types of rainforests as they are introduced to plants, animals, and people around the world, including those from the temperate rainforests of North America to the tropical rainforests of Southeast Asia, Africa, and South America. Rainforest-inspired activities include making a West African yam festival gourd rattle, building a model of an Alaskan totem pole, and creating a Japanese Wayang-kuilt, or shadow puppet. Kids are encouraged to make a difference and become active supporters of the rainforests no matter where they live. Gotta dance! Gotta sing! Gotta do most anything because it’s show time! In Show Time! kids will learn to become “triple threat” performers, developing their skills as singers, dancers, and actors through more than 80 activities that include imitating a musician or musical instrument, acting out a song, creating a mirror dance, making puppets and playbills, and more. Along the way, they’ll learn about the history of musicals, discover musicals about history, and find out how to get it all together before the curtain goes up. Show Time! is perfect for teachers needing to prepare performers for a show; for parents looking for fun ways to fill spare minutes with their kids at home, in the car, or in a doctor’s waiting room; and for kids wanting ways to enjoy themselves on their own or in a small group. Several play scripts, a list of suggested musicals for kids, and a play glossary are included. Counteracting the panic and fear associated with getting lost in the wild, this handbook equips children with practical tools for overcoming adverse wilderness experiences, even if they are endured alone. Compiled by a search-and-rescue professional, straightforward advice is offered on building shelters and fires, signaling for help, finding water and food, dealing with dangerous animals, learning how to navigate, and avoiding injuries. Practice projects are included to hone survival skills—such as starting a fire with a reflective surface, casting animal tracks, or using a treasure hunt to test navigational aptitude. Making a strong argument for danger prevention, each lesson is coupled with simple instructions and diagrams that will reassure and empower young adventurers. Explaining the language of finance and the skill of investing, this guide gives kids an early start at making their money grow. The book explains the general concept of money and demonstrates how saving works based on the concepts of simple and compound interest. Children then learn where Wall Street is located, what stocks and bonds do, and, with the help of an adult, the right way to buy or sell a stock, mutual fund, or savings bond. Dozens of projects illustrate how to balance a checkbook, read a stock table, and understand common financial terms such as inflation, recession, and the Federal Reserve Board. This updated edition details the current financial environment, including what is meant by a global economy, economic clues for recovery, and a special section on what mortgages are and how they work. Updated resources for further information online are also included. Covering a wide variety of everyday chemistry concepts from the very simple to the more complex, this question-and-answer primer provides straightforward, easy-to-understand explanations for inquisitive young scientists’ questions. A dozen unique experiments to try at home—from lifting latent fingerprints from a “crime scene” using super glue (for smooth surfaces) or iodine (for paper) to hollowing out the zinc interior of a penny using muriatic acid—are interspersed with the answers to such questions as What makes soda so fizzy? and Why do you get cavities when you eat too much sugar? From separating food coloring into its component dyes to using easy-to-find chemicals to create “slime,” Silly Putty, or bouncing balls, this handy guide is the ideal resource for the budding chemist.